The swipe technology launched it’s latest budget smartphone Konnect Grand . The new swipe Konnect Grand has features 5″ FWVGA (854×480 pixels) display and it’s powered by 1.2GHz Quad-core processor coupled with 1GB RAM and 8GB of internal memory which can be further expanded via micro SD card up to 32GB. The new swipe Konnect Grand packs with 5Mp Rear camera with LED flash for low light conditions and A 2Mp front facing camera for video call and selfies. 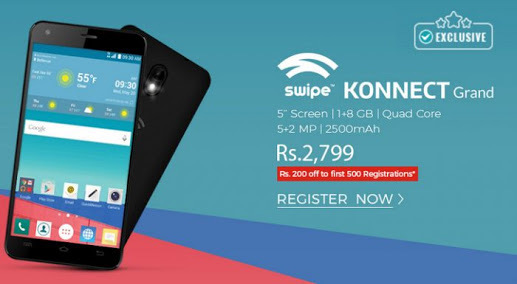 The swipe Konnect Grand runs on Android 6.0 Marshmallow and goto connectivity option it has 3.5mm audio jack ,wifi 802.11 ac , fm radio , and it’s 3G mobile this is the disadvantage but this budget it’s ok and also Bluetooth, Gps. The swipe Konnect Grand packs with 25,000 mAh battery is better and unexpected thing due to the Moto G3 have only 2,430mAh battery. The swipe Konnect Grand available exclusively from shopclus.com and also 10% cash back offer by using Airtel Money wallet. The swipe company’s recently launched 4G LTE smartphone at this same price tag.